The Meal Gap, our official measure of food insecurity, represents the meals missing from the homes of families and individuals struggling to put food on the table—or, when household food budgets fall too short to secure adequate, nutritious food year-round. According to Feeding America’s Map the Meal Gap annual in-depth study of hunger, there are more than 326,000 individuals in the Food Bank’s service area who experience food insecurity. For those people, there was a shortfall in 2014 of more than 58 million meals needed to meet their food needs. These missing meals are the meal gap in southwestern Pennsylvania. The Food Bank has a tremendous impact on the meal gap and food insecurity in our community. With the help of our supporters and partners, we distributed more than 33 million meals in southwestern Pennsylvania in 2017. Unfortunately, there were nearly 25 million additional meals needed in our community that we were unable to provide. 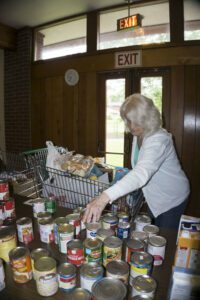 While many of our neighbors in need are accessing food assistance, the reality is that there are still many more individuals, families, children and seniors in our region who go hungry every day and whose very basic human needs are not being met. Explore more at Feeding America’s Map the Meal Gap.